Remember Furbies? Riding on the tail of Beanie Babies, Furbies peaked in popularity sometime around 1998, then were never to be seen again. It had something to do with them being stupid. 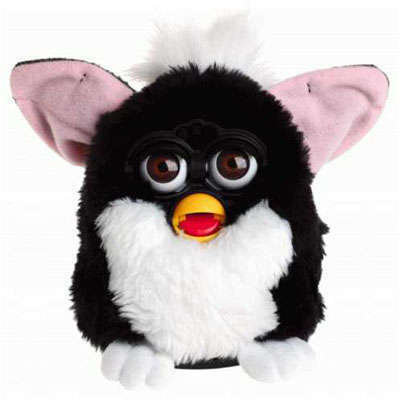 Furbies were little furry robots that would talk to you, or rather would speak a language called “furbish” which was a bunch of cutesy grunts and baby-talk. Funny story: some people believed that Furbies had the ability to learn (not unlike The Terminator). Although these rumors were completely untrue, several intelligence agencies banned Furbies from their offices for security reasons. This entry was posted on Friday, April 30th, 2010 at 10:07 am	and is filed under toys.